The swimming pool at Radisson Blu Resort Fiji enclosed by beach-like environment. 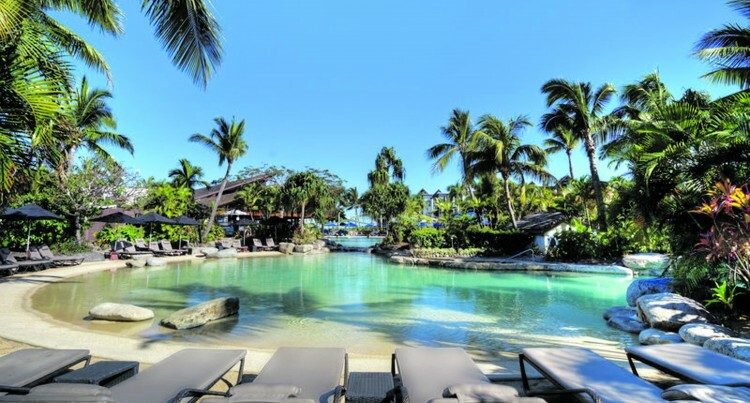 One of Fiji’s top holiday destinations, the Radisson Blu Resort Fiji on De­narau Island, is proving to be a hit with an increasing number of guests. With the full $14 million refurbishment of all their rooms still underway, the re­sort is fast becoming the target of families coming to Fiji. Taking into consideration the Fijian environment, the lobby and new kitchen were also refurbished with impressive de­sign features. Director sales and marketing Suzie Jones said the resort was going through a full re­furbishment. “We started in November last year and are probably pretty close and half way through,” she said. The guest rooms are the star attraction given its unique design. “We’ve always had a bath over the shower and as a five-star property, we needed to make sure that there was a shower only,” Ms Jones said. “The bath and shower in the one-bed­room suites will stay as they are. All the guest rooms have new furniture, fixtures and paintings. In the one-bedroom suites the kitchen remains, the separate lounge remains but everything else is new. “Nothing but good comments have been received on how the room looks,” Ms Jones said. “We did the lobby first, got a new kitchen built and besides this carried out works considering the importance of the Fijian environment. Ms Jones said the refurbishments started in 2013 and has been ongoing. Raddisson Blu has 270 rooms separated into 135 guest rooms and 135 one-bed room suites. Fifty per cent of the rooms have already been refurbished, Ms Jones said. She said that so as not to disrupt or be a hindrance to guests, they had to carry out the refurbishments on a block-by-block basis, hoping to complete it by February 2019. “The important part is if we decide to close a bock off, everything including the number of visitors is taken into consid­eration,” Ms Jones said. Ms Jones said guest come to the ho­tel mainly through the Trip Advisor, an American travel and restaurant website company. “With the family market, we are number one for families in Fiji and we make sure to bring in the right people to fix this ho­tel,” Ms Jones said.